After the long cold winter we’ve had, seeing the crocuses and daffodils last week was a welcome sight. 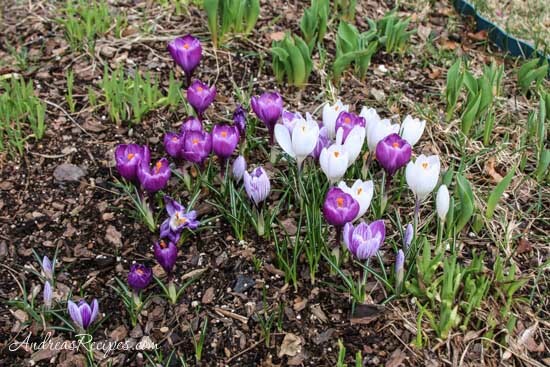 The crocuses only lasted a few days, but their bright purple and white blooms made a beautiful splash of color in the flower bed. The daffodils took a few more days, then they burst into color. 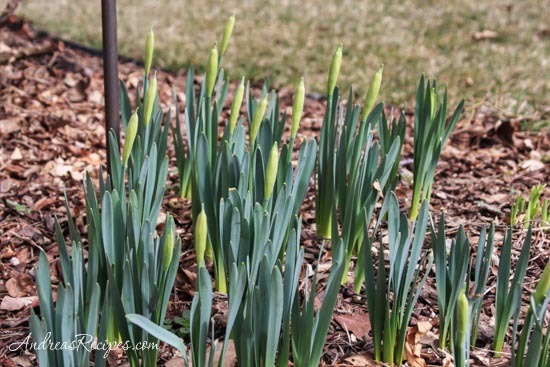 My favorite is the yellow daffodils because they look like sunshine welcoming spring at last. We noticed fewer blooms this year and new plants sprouting, so once the flowers dry we’ll dig up the plants and divide them. The Johnny Jump Ups (edible) started peeping up in their containers last week. 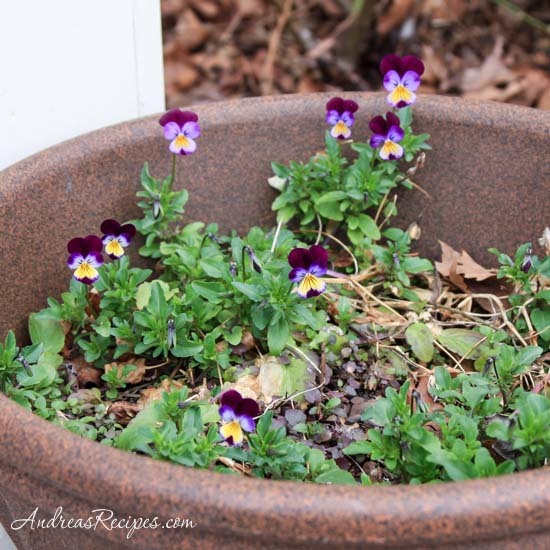 Their dainty little purple and yellow faces are a favorite of mine. They reseed themselves every year, sometimes completely filling the pots, and I sprinkle in a few more seeds about every other year. They look beautiful in front of the porch steps until the weather turns hot. 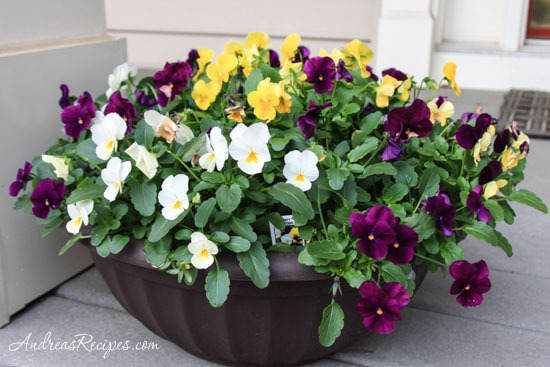 This beautiful pot of violas (edible) was at Costco, and I couldn’t resist sitting them at the top of porch overlooking the steps. 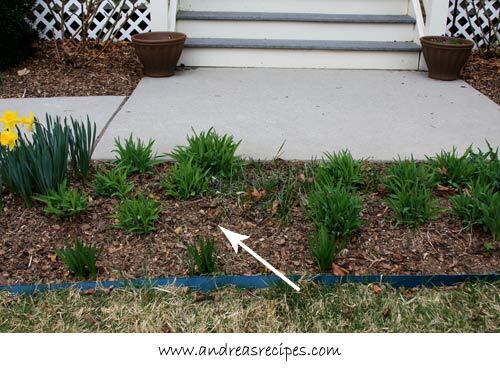 Since the crocuses, daffodils, tulips, and daylilies have all sprouted, now is a good time to assess where the garden has bare spots and could use a some filling out. I’m actually behind one year on this because I had planned to do it last spring, then forgot and kicked myself last fall when I didn’t know where to plant, so I postponed the project. The big bare spot above will be great for more crocuses, which we love to see in the early spring. This part of the bed will get a few more Notting Bells (unsure of the correct name, still researching) to complete a border of them along the front edge of the bed. We like the little white bell-shaped flowers that bloom in spring. Other bare patches will get some more crocuses. 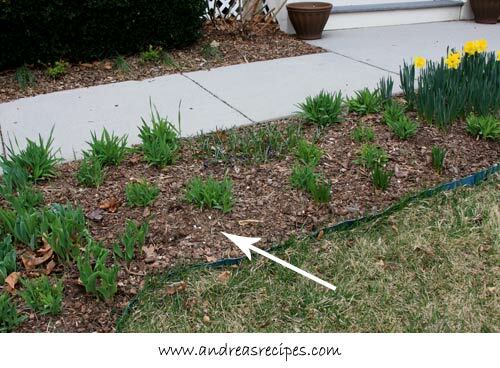 We’ll add more crocuses in that bare spot next to the existing crocuses. 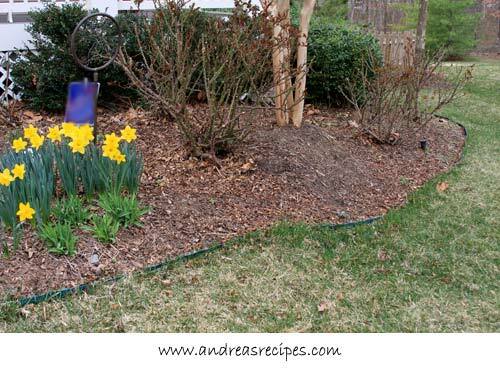 This big bare area in front of the rose bushes and crepe myrtle needs some spring color, so we will plant bunches of daffodils and tulips all along the border, and maybe crocuses. The rose bushes fill out and burst with pink blooms in the summer through autumn, so we don’t need to add summer color to that spot. 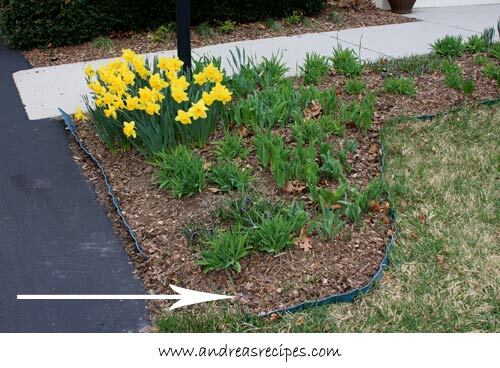 We will also add some tulips behind the daffodils. This sad looking spot is the site of several failed gardening experiments. The long thin green leaves are saffron crocuses that have never, ever bloomed, and the three barely visible bushy things are miniature rose bushes that are, well, too miniature. I’m still trying to decide what to do here, maybe a mix of tulips and daylilies. The front bed is filled with stella d’oro daylilies, which bloom continuously throughout the summer, providing a gorgeous show of golden color. I recently found out about the purple d’oro daylily, which also blooms continuously through the summer and into autumn, and those would coordinate well with their yellow cousins. We haven’t decided yet, I’m still looking around to decide what we want for this spot. 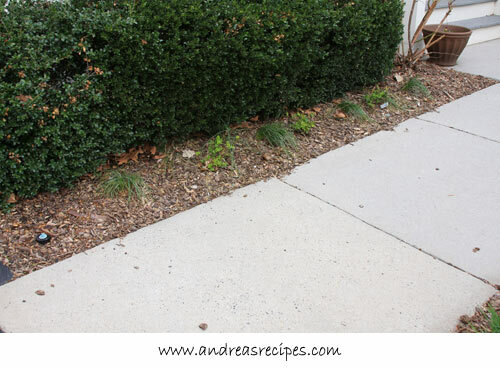 The idea is to get lots of color on plants that don’t grow too tall so they don’t block the boxwoods. I love seeing those first crocuses of spring pop up! Your garden must be beautiful! Thanks Kellypea. I always enjoy playing with the flower garden, even the weeding. Maris, I agree. The first crocuses always make my heart sing. I love all the early blooms. Next year is my year to redo the front yard and plant my favorite bulbs. Have been focusing on the backyard vegetable gardens and orchard. Bought the house three years ago and they have a fairly nice front yard, but we all like to put our own stamp on it, don’t we. So, although it’s not exactly what I want, the front is fine until I can make the changes. But, thanks for sharing your beautiful spring beauty!